On March 23, 2015 the Bill and Melinda Gates Foundation (BMGF) and the United States Agency for International Development (USAID) sponsored a secret meeting in London to promote a recent report they commissioned detailing in clear terms how to privatize the seed and agricultural markets of Africa- without African stakeholders having a seat at the table. CAGJ/AGRA Watch and Global Justice Now coordinated simultaneous actions in Seattle and London. Photos: See Community Alliance for Global Justice/AGRA Watch photos of Seattle Action here. See Global Justice Now photos of London Action here. KOMO Radio covered action all day, can’t find link. 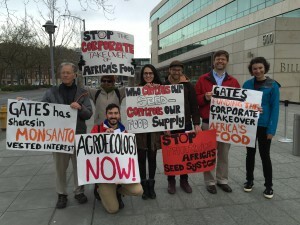 Please put us in touch with the group of Zimbabwean farmers who visited Seattle to challenge the Gates Foundation and its GMO seed sponsorship. We are ready to offer them plans and assistance if desired for a cellphone-based direct food crop marketing system for higher farm-gate prices and profits.